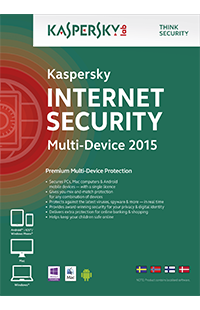 Kaspersky Lab Internet Security 2015 - 5PC Download Product Description Details Core Protection Innovative Hybrid Protection Our innovative hybrid protection combines the power of the cloud with our advanced technologies housed on your pc to deliver a faster, more effective response to today’s complex, ever-evolving threats. You’ll benefit from the speed and volume of security data from the cloud, while also taking advantage of our ability to detect and analyze suspicious behavior on your pc; capture malware that is passed to you while you’re offline via a usb or other device; and block, treat, or rollback harmful activity. The result of this hybrid combination is unmatched security that won’t slow you down, leaving you free to enjoy the internet and your pc to their full potential. Combining our core protection with premium internet threat defense Kaspersky internet security 2015 combines all of the essential protection of our leading antivirus software with additional layers of defense against hackers, malicious applications and websites, identity theft, spam, and even the most complex internet threats. There’s no better protection for when you’re surfing the web, banking and shopping online, social networking, and enjoying the internet to its full potential. plus, with intelligent scanning, smart updates, and an incredibly user-friendly interface, kaspersky internet security is the easiest, least intrusive way to ensure you’re always safe. Rapid, Real-Time Reaction to New Threats New Internet threats emerge with lightening speed, and the latest Kaspersky technologies are there to protect you with real-time data from the cloud. Plus, you’ll benefit from millions of users around the world via the Kaspersky Security Network. When suspicious or unrecognizable data is encountered on one of those systems, it’s automatically analyzed by our lab, and real-time, protective updates are issued to all of our users, giving you the ultimate protection as new threats emerge. Two-way Firewall Kaspersky’s best-in-class, two-way firewall provides a secure perimeter around your pc to keep hackers out. But it also provides protection in the opposite direction by controlling what’s transmitted from your pc to the outside world, stopping malware from sending out your personal information. it’s one more layer of defense keeping your personal information from falling into the wrong hands. Anti-spam Spam can be more than an annoyance—it can be a vehicle for delivering malware to your pc. Kaspersky utilizes the latest cloud technologies and advanced behavioral analysis to quickly and efficiently recognize and block new spam. Advanced Protection Proactive Detection of Unknown Malware The latest Kaspersky technologies proactively seek out suspicious activity on your system—without draining performance. Potential threats are monitored and analyzed with real-time, cloud technologies, and dangerous actions are completely blocked before they can cause any harm. Rollback of Malware Changes Kaspersky’s multiple layers of protection are your best defense against cybercrime, delivering premium protection from new and emerging threats. And if an unknown piece of malware does manage to find its way onto your system, Kaspersky’s unique System Watcher will detect the dangerous behavior and allow you to undo most unwanted and harmful activity. Safe Run* Kaspersky’s innovative safe run mode provides an added layer of protection for running suspicious or unknown applications, files, emails, and websites. the “safe desktop” mimics your actual desktop, but is completely walled-off from your data and pc settings, so you can test-drive anything suspicious with total confidence that no harm will come to your system. *Works on 32-bit operating systems One-click Security Checks The security status and reputation of any application, executable, or script is now at your fingertips. With a single mouse-click, file advisor uses cloud technologies to instantly send you information such as filename, size, date created and last modified, threat rating, digital signature, geography, distribution, and other kaspersky users’ level of trust. Now you can make more informed decisions about the files you’d like to access.. Safer Surfing with URL Advisor and Safe Surf Kaspersky internet security acts as your personal security guide as you surf the web. Our updated url advisor now adds color-coded tags to all web links within search results to advise you of the danger level of the link and subsequent pages. And our customizable safe surf alerts you to suspicious sites, helping you make informed decisions about where it’s safe to share your personal information. Online Banking Mode* Online banking is incredibly convenient, and kaspersky makes it safer than ever. simply enable kaspersky’s unique online banking mode and the financial websites you access will automatically open in a special walled-off environment. This extra layer of security keeps hackers out and ensures your financial information is always safe. *Works on 32-bit operating systems Application Control Kaspersky’s unique application control uses real-time, cloud-based threat intelligence to determine security privileges for every application you launch—without impacting system performance. Unknown or suspicious applications are watched or restricted from potentially-harmful actions, and potentially dangerous applications are completely blocked from harming your system. Vulnerability Detection One of the easier ways for cybercriminals to find a hole in your protection is through application and system vulnerabilities that haven’t been updated with the latest fixes. Kaspersky Anti-Virus finds these vulnerabilities, and assists in patching the holes in your protection before they can be exploited by viruses, spyware, and identity thieves. Secure Social Networking for you and your children The latest kaspersky technologies allow you to fully enjoy social networking, knowing your facebook, myspace, and twitter accounts won’t receive malicious links or software from your friends. Plus, you can ensure your children’s safety by controlling which contacts are allowed for communication, monitoring messaging logs, and specifying any personal information you want blocked from transmitting. Geo Filter Kaspersky’s unique geo filter lets you block content from specified countries. If you have no interest in content from non-english peaking countries – which include many with a history of producing malware—you can prevent that potential malware from reaching your machine. Now you don’t have to worry about a perfectly legitimate and trusted english-language website being compromised and sending you malware from an overseas server. Network Attack Blocker Kaspersky scans all incoming network traffic for activities that are characteristic of a network attack. If an attempt to attack your computer is detected, kaspersky blocks any and all network activity from the attacking computer. Rootkit Detection Rootkits are designed to conceal system infections, and can be very difficult to detect by common antivirus tools. Kaspersky Anti-Virus uses special methods specifically designed to detect rootkits, ensuring you’re protected from this advanced threat. Identity Protection Anti-Phishing Defense Phishing attacks are becoming more common, and much more tricky. It’s increasingly difficult to know if an email is really from your bank, for example, or a cybercriminal trying to lure you into revealing confidential information. Kaspersky uses cloud technologies to update and reference an online database of phishing websites in real-time, and proactively analyzes URLs, so new phishing attacks are caught as soon as they emerge. You can be confident that your digital identity is always safe. Online Banking Mode* Online banking is incredibly convenient, and kaspersky makes it safer than ever. Simply enable kaspersky’s unique online banking mode and your financial websites will automatically open in a special walled-off environment. This extra layer of security keeps hackers out and ensures your financial information is always safe. *Works on 32-bit operating systems Virtual Keyboard Kaspersky’s Virtual Keyboard is a special online tool for entering private data such as credit card numbers and passwords. It’s an on-screen keyboard you use with a mouse, so the data you enter can’t be tracked or stolen by keyloggers, hackers, or identity thieves. It’s one more layer of defense ensuring the safety of your digital identity. Family Protection Advanced Parental Control Keep your kids safe and responsible with kaspersky’s award-winning family protection. Control access to the pc, internet, applications, games, and websites. block, limit, or log communications via im and social networks. Control file downloads. Even block the transfer of private data such as phone and credit card numbers. Now you can easily and conveniently protect your kids online even when you’re not right there. Secure Social Networking for you and your children The latest kaspersky technologies allow you to fully enjoy social networking, knowing your facebook, myspace, and twitter accounts won’t receive malicious links or software from your friends. Plus, you can ensure your children’s safety by controlling which contacts are allowed for communication, monitoring messaging logs, and specifying any personal information you want blocked from transmitting. Performance Intelligent Scanning Kaspersky’s unique technologies keep your system at maximum performance while still delivering premium protection from viruses and spyware. Files are scanned only if they’ve been opened or modified, and behind-the-scenes activities are reduced when you’re placing demands on your PC. So you can enjoy watching movies, surfing the web, or toggling multiple programs without disruption from your security software. Smart Updates Kaspersky has always delivered especially small updates that minimize the drain on your PC’s processing power—less than 1% CPU usage! And now we’ve added another level of intelligence to our updates: only active components of the software are updated at any given time, thus minimizing the number of updates and time needed to download them. You still receive maximum protection, but with reduced network traffic and resource use. Gamer Mode Switch on Gamer Mode to block pop-ups and reduce the use of your PC’s resources to a bare minimum. Games won’t be interrupted or slowed, and Kaspersky will still block any hackers or malware that tries to sneak onto your system. Additional Features Unmatched Usability with a New Interface We’ve taken a fresh, new approach to our user interface, ensuring it’s easier than ever for you to manage your PC security. You’ll find instant visibility into your protection status, one-click access to the features you use the most, and a detailed guide to how our cloud technologies are working for you. Easy-Access to Security Status Feel confident in your protection status with a quick glance at your desktop. Kaspersky’s Desktop Security Gadget* prominently displays if your security is up-to-date, or if an action is required. Customizable buttons allow you to have the protection features you use the most close-at-hand. And you can drag and drop files onto the gadget for easy, on-the-spot virus scanning. *Works with Windows Vista & Windows 7 Installation on Infected PCs If your PC is so severely infected that no antivirus software can be installed on it, Kaspersky will download a proprietary tool to scan and eliminate all threats. If the damage is so severe that the operating system can’t even launch correctly, the Kaspersky Anti-Virus installation CD can be used as a bootable Rescue Disk to detect and eliminate all infections. You can then quickly and easily proceed with the product’s installation. Optimized for Netbooks Kaspersky Anti-Virus supports screen resolutions found on netbooks – including 1024x600 and 1366x768 – with no impact on system performance. Free Technical Support Free North American-based technical support is available via telephone, email, and online chat. Additional support includes Kaspersky knowledge base, an online database of detailed answers to questions about installing and using Kaspersky Lab products. Additional Information Manufacturer	Kaspersky Package Type	Full Version Media Type	DVD-ROM Processor	Intel® Pentium® 4 or AMD Athlon® 64 processor Operating System	Microsoft® Windows® XP with Service Pack 3; Windows Vista® Home Premium, Business, Ultimate, or Enterprise with Service Pack 1; or Windows 7 Graphics Card (GPU)	1024x768 display (1280x800 recommended) with qualified hardware-accelerated OpenGL graphics card, 16-bit color, and 256MB of VRAM Memory (RAM)	1GB Hard Drive	1GB of available hard-disk space for installation; additional free space required during installation Shipping	This product is eligible for free shipping!